This week on Barking Wednesday I wanted to share some info on your Dogs Breath. Daily bad breath could be caused by dental problems or dog food. But if you notice a change in your dogs breath - it could mean serious issues. If you dogs breath starts smelling sweet or fruity - this could be the sign on diabetes. A really stinky breath - plus vomiting could be a sign of liver problems. The best advice I can give dog owners is to make sure to tell your vet about your dogs bad breath. Your vet can run test and find out what is the underlying cause for the bad breath. The vet always tells me that Kingers has excellent teeth and gums for his age. My secret is raw bones. I buy him a new bone each week from the butcher. The chewing on the bone is a great natural way to keep his teeth and gums in good shape. IMPORTANT!! ~ Make sure to pick up the bones off the floor. 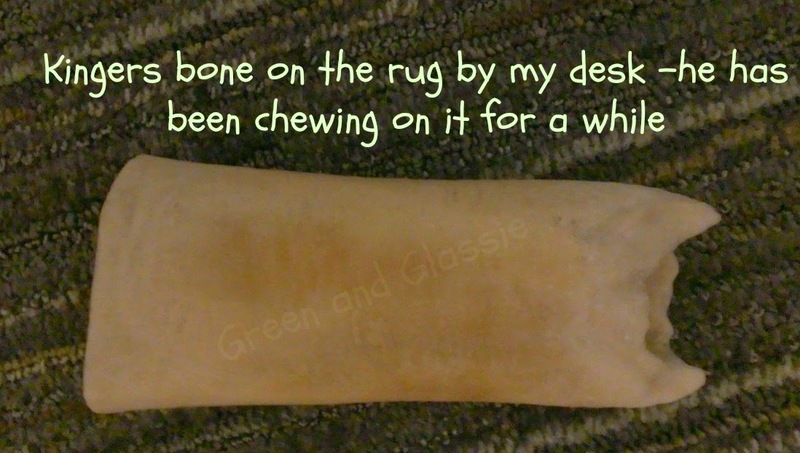 Stepping on a bone can really cause problems. They have been known to break a adult ankle! As always check with your vet to make sure raw bones are right for your dog.